The housing market today offers a prime opportunity for those seeking to apply for a mortgage. Mortgage rates are at a historic low, which is why so many people choose to refinance their homes. It is estimated that as much as 80 percent of mortgage applications are for refinances. A mortgage refinance is simply the process of turning an old home loan into a new one with different terms. Most people refinance to get extra cash to remodel, pay bills, shorten their mortgage loan term or to lock in lower interest rates. Getting lower interest rates is where streamline refinances come into play. These refinances allow homeowners to obtain new mortgages with current market rates that are typically lower. Streamline refinances differ from regular refinances, because they require less paper work. Streamline refinances are offered by different federal agencies and, hence, go by different names. The types of streamline refinances are FHA, VA, USDA and HARP. Here is a quick comparison between the programs. FHA refinances are available to homeowners with mortgages ensured by the FHA. Additionally, homeowners must have an FHA mortgage that is at least 210 days old with no late payments within the past three months. Also, the refinance must have a Net Tangible Benefit–a positive outcome such as a lower interest rate. A benefit of an FHA refinance is that it requires less paperwork than a normal refinance. FHA refinances do not require verified income, employment or assets. An appraisal is also not required for this type of streamline refinance, and there is no out of pocket costs. Hence, homeowners save valuable time and money when they use the FHA refinance program. There are a few downsides to an FHA streamline refinance. For this type of refinance, the home must be the principal place of residence; so investors who buy homes to rent do not qualify. Also, there is no cash back option. The Department of Veterans Affairs offers a streamline refinance program to veterans with VA home loans. The VA streamline refinance program is formally named the Interest Rate Reduction Refinance Loan, or IRRRL for short. To qualify for the program, homeowners have to verify that they have occupied the home at one time, have no more than one 30-day late payment in the last year and have the refinance lower their current mortgage rate. There are exceptions for mortgages with adjustable rates. VA refinances are more quickly processed and do not require income, asset, employment or credit verification. Mortgage insurance is also not required to get a VA streamline refinance. VA refinances are only available to homeowners with VA-guaranteed mortgages. Also, home appraisals might be required depending on what VA-approved lender processes the refinance. USDA refinances are available to homeowners who currently have a mortgage guaranteed by the USDA–generally those with rural mortgages. Other requirements are that the home is the primary residence with no late payments in the last year. Homeowners must also live in a USDA pre-approved state. Like with the other programs, a USDA refinance does not require the verification of employment, credit or income. Also, USDA refinance loans are designed for homeowners who are underwater with their original mortgages. The biggest setback of the USDA refinance program is its lower availability. USDA refinances are offered only in 19 of the 50 United States. Those states are: California, Oregon, Arizona, Nevada, New Mexico, Michigan, Illinois, Ohio, Indiana, Tennessee, Kentucky, Mississippi, Alabama, Georgia, Florida, North Carolina, South Carolina, Rode Island and New Jersey. 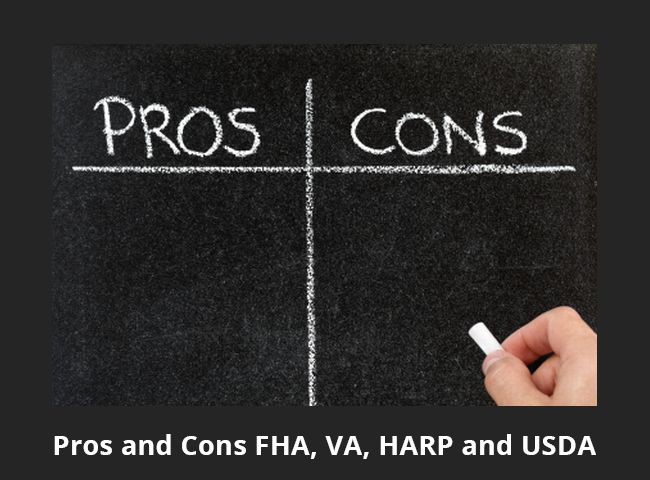 HARP stands for the Home Affordable Refinance Program. These refinance loans are available to homeowners with mortgages ensured or owned by Freddie Mac or Fannie Mae. Requirements include being current on mortgage payments with no more than one late payment in the last year. Also the original mortgage has to have been securitized—-meaning owned or sold to Freddie Mac or Fannie Mae–on or prior to May 31 of the year 2009. The loan-to-value ratio of the original adjustable mortgage must be more than 80 percent as well. Employment, credit and income do not have to be verified. Also fixed-rate mortgages are allowed unlimited loan-to-value ratios. Not all mortgage servicers participate in this program. Also, the program is scheduled to be phased out on December 31, 2015. *This is a brief overview of the different types of streamline mortgages available. Each program has its own requirements, but all of the programs are designed to be quick refinances with little paper work.